My mother always told me not to play with my food. Of course, my mother is neither Ethiopian nor Eritrean, and there were no local restaurants featuring those cuisines during my childhood. If there had been, she probably would have played with the food herself. And so it was that we ended up, my mother and me, at Muzita Abyssinian Bistro (4651 Park Blvd. in University Heights), an upscale Eritrean / Ethiopian restaurant in University Heights, to celebrate her birthday and play with our food. The cuisines of Abyssinia (Eritrea and Ethiopia)—two countries locked in embrace and sharing common history and culture—are similar. The primary differences are that the lower elevations and coastline of Eritrea lead to a somewhat lighter cuisine incorporating more seafood. There is also this: Where Eritrea was colonized by Italy, Ethiopia is the only African country never colonized. Another commonality is injera, a spongy, crepe-like sourdough bread made of teff flour that serves as both plate and utensil. 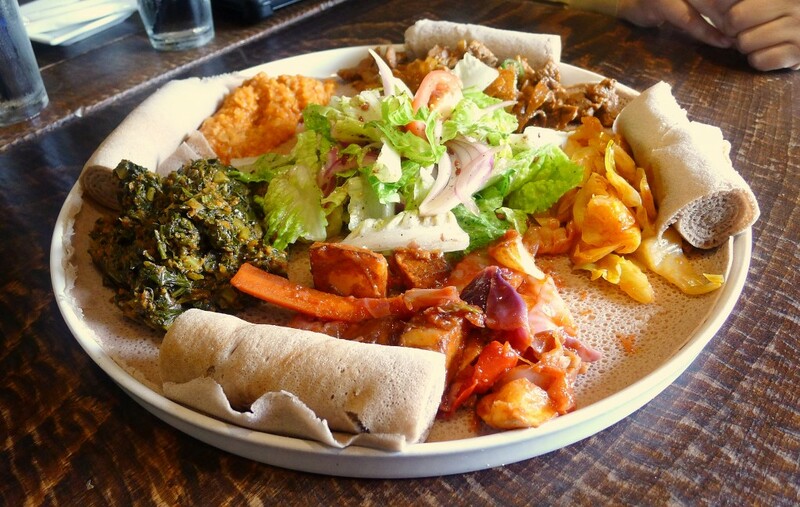 The entire meal is served on a platter topped with a big round of injera, each dish in its own little mound with additional roles of injera on the side. The goal of the playing-with-your-food game is to use just enough of the injera to grasp the food but not smother it. Among the best and most characteristic of Abyssinian dishes is tsebhi dorho (known as doro watin Ethiopia), a flavorful dark-meat chicken stew cooked with more than a little bit of berbere (a red-chile-based spice blend that is their chili powder) and served with a hard-boiled egg. The result is undoubtedly spicy, but it’s also well-balanced. The berbere does not overpower the dish but brightens it. Another standout is beggie kilwa, lamb sautéed in clarified butter with onion, garlic, tomato, herbs and Serrano chiles. On two separate trips, the lamb was absolutely perfectly cooked, nicely seared but tender. The spice level was lower than it was with the tsebhi dorho—a tickle more than a burn. There are also vegetarian options at Muzita. My favorite is the cabbage stewed with berbere,which was sweet and spicy yet still retained crispness on one visit (but a bit overdone on another). The lentils were less than exceptional, but roasted potato chunks were perfect. Muzita’s menu boasts, “You enter our restaurant, you are entering our home.” But you don’t suspect this place is a copy of their old place on the outskirts of Asmara or Addis Ababa. It’s a nice house, well-appointed with a pleasant balcony with heaters. You have a sneaking suspicion that this is not quite the way it looks in the old country. But it’s the food that’s Muzita’s real source of comfort. What stands out is how unique, delicious and strangely comforting it is. How can something for which we have so little frame of reference, something so exotic, be so soothing? One part of it is those deep flavors. Another is that playing-with-your-food thing. It brings you back to a simpler time and place in your life. That, at least, is what my mother said.